1. 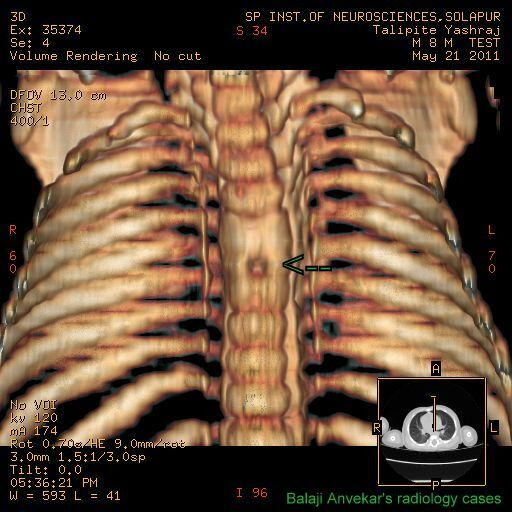 A mid line circular vertebral defect - persistent canal of Kovalevsky better seen on CT 3 D Reconstructed images of spine. 2. Fusion of hypoplastic D4-5 vertebral bodies - an associated abnormal segmentation anomaly. Focal kyphotic deformity. Reversal of normal cervical lordosis. Smooth focal widening of bony spinal canal with widened interpeduncular distances. 3. A well demarcated intra spinal extra dural predominantly cystic mass. The cystic component is having clear fluid iso intense to Csf, anterior to the cord causing significant compression over cord. Spinal cord cranial to this compression show diffuse swelling with marked abnormal intramedullary T2 high signals implies to cord odema which is cranially extending up to medulla. 4. A small focal T1 bright fat in the caudal portion of the mass - an associated lipoma. 5. The cyst show multilocular enhancement and enhancement along the wall of cyst better depicted on sagittal post contrast T1w and fat sat T1w images is the enhancing Dura. 6. 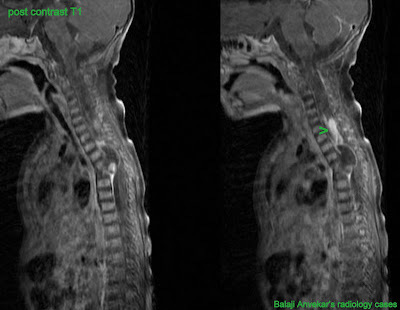 On axial T2w images spinal cord is split, show focal atrophy with an intra medullary invagination of the cyst - Myeloschisis. Imaging wise diagnosis: Neuroenteric cyst - a subgroup of split notochord syndrome spectrum.